Todd Hewitt is the last boy in Prentisstown. But Prentisstown isn’t like other towns. Everyone can hear everyone else’s thoughts in a constant, overwhelming, never-ending Noise. There is no privacy. There are no secrets. Just one month away from the birthday that will make him a man, Todd unexpectedly stumbles upon a spot of complete silence. Prentisstown has been lying to him. I’ve heard a lot of good reviews for this book from various book blogs and book friends, but I never picked it up because I wasn’t into dystopia back then. In fact, I saw a copy of this book a couple of times in Fully Booked but I always ignored it. No time to read it, I always think. After some really strong recommendations, I finally got a sample from Amazon and read the first few pages, thinking that if I really want it, I can always get the Kindle edition. But as I read on, I knew only one thing: I MUST HAVE THIS BOOK. Not the ebook, but the actual print book, because there are parts of the book that just looks better in print. Unfortunately, on the day I decided I wanted the book, the only copy in the Fully Booked branch nearest my office was gone. :( My friend Jana, who also wanted the book, got to the last copy first, so I would have to wait. *grumble* Thanks to the wonderful people of Fully Booked, though, for transferring a copy to Eastwood a week after I inquired to them about it. Of course, I wasn’t able to read this immediately, and it wasn’t until about a month from when I got this that I got to read it. The first thing you find out when yer dog learns to talk is that dogs don’t got nothing much to say. About anything. I must do a Russell from Up impression here: “BUT IT’S A TALKING DOG!” :) From that moment on, I knew that even if I didn’t like the book in the end, I’d still be fond of the talking dog. I really wasn’t sure what to expect as I read this book because I stayed away from as many spoilers as possible, so I plunged into the book knowing only the basic stuff: Todd is the last boy in Prentisstown, where only men live and everyone can hear the other person’s thoughts. Then he discovers a “hole” in the noise, complete silence that is impossible in the world he grew up in. Todd is then made to run far, far away from Prentisstown for reasons he couldn’t understand, which leads to a chase to a world outside he thought never existed. It took me a while to really get into the book, despite the talking dog, because of the way Todd talks. The Knife of Never Letting Go is written in Todd’s point of view, and growing up in the New World has given Todd a different way of talking, which may be because of the deterioration of education in Prentisstown since the boys don’t go to school nor read. Most of narration becomes Todd’s actual thoughts, most of which spill over each other and sometimes goes on and on without periods that I ran out of breath while reading it even if I was doing so silently. The language is reminiscent of The Strawberry Girl by Lois Lenski, but more rough and raw as I wasn’t just seeing things happen, but feeling them since I had access to Todd’s thoughts (and whoever’s Noise he can hear). It took me a while to get the hang of it, but when I did, the book gripped me and refused to let go. Patrick Ness is one heck of a writer, and I admire him for never being afraid of hurting his characters. As a (wannabe) novelist, I always have problems with hurting my characters because they’ve grown close to my heart as I write them, and hurting them feels like I’m hurting myself. If you’re that type of reader who grows attached to characters they read and hate it when they get hurt…well, be prepared because Ness can be pretty ruthless. I always get a sense of dread whenever Todd would end up content and somewhat happy in one place because I know the author is just preparing to bring out another big gun that would send Todd and his companions running. It’s not bad, of course, but rather very effective because it kept me reading, rooting for Todd and wanting him to win it in the very end. The action scenes were satisfying, the running and the panic felt very real, and Ness kept the mystery of Todd’s history kept very well up until the revelation point, and he didn’t reveal everything so much that all questions were answered. “Here’s what I think,” I say and my voice is stronger and thoughts are coming, thoughts that trickle into my noise like whispers of truth. I can’t wait to start reading the next book, The Ask and the Answer, which I am reserving for the YA-D2 reading challenge. The Knife of Never Letting Go is a dark, fast-paced and action-packed dystopian novel that will surely have you at the edge of your seat. If you see this in the bookstore, don’t think twice: just get it and read. I promise you won’t regret it. The rawness of Todd’s voice makes its easier to get into him. You’re not just accessing a boy’s thought, you are accessing his whole being. This book deserves more attention than it gets. The simple white cover is what I think the reason why people tends to not give it a second-glance. Exactly. That’s what makes this book even more stunning. I think people would either think it’s too violent given the title, or maybe even a bit too thick (although other books are definitely thicker than this). I also think the reason why not too many people read this here is because there’s too few copies of this book. I bet more people would be curious if it’s readily available. 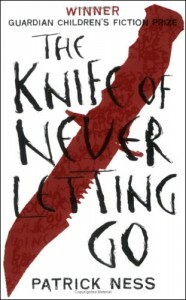 This review makes me want to read the Knife of Never Letting Go AGAIN. I like the way you view Todd’s character development and Patrick Ness hurting his characters. “I always get a sense of dread whenever Todd would end up content and somewhat happy in one place because I know the author is just preparing to bring out another big gun that would send Todd and his companions running. It’s not bad, of course, but rather very effective because it kept me reading, rooting for Todd and wanting him to win it in the very end”. If you felt sorry for the characters in the first book, then, I’ll wait for your reaction after you read the second and third book. Really glad you liked it and love your review. :) I actually loved Todd’s voice right away. It seemed stream-of-consciousness, but not entirely so. And yes! You don’t just read Todd–you feel him. Also, it’s not that I think Ness was ruthless towards his characters. Just very brave not to romanticize what shouldn’t be romanticized–that we all fall.